Plymothian Transit: A Breton Cyder? ©Dale Tringham - used with permission. From the days of 'proper' Corporations with a crest of arms, comes Plymouth 61 (MCO 661), a Leyland PD2 with Metro Cammell H56R body work. I presume that Whiteway's went into the great cyder pot in the sky some time ago? Opposite Bretonside Bus Station, 24th May 1969. Thanks to Dale for allowing me to use his photo. 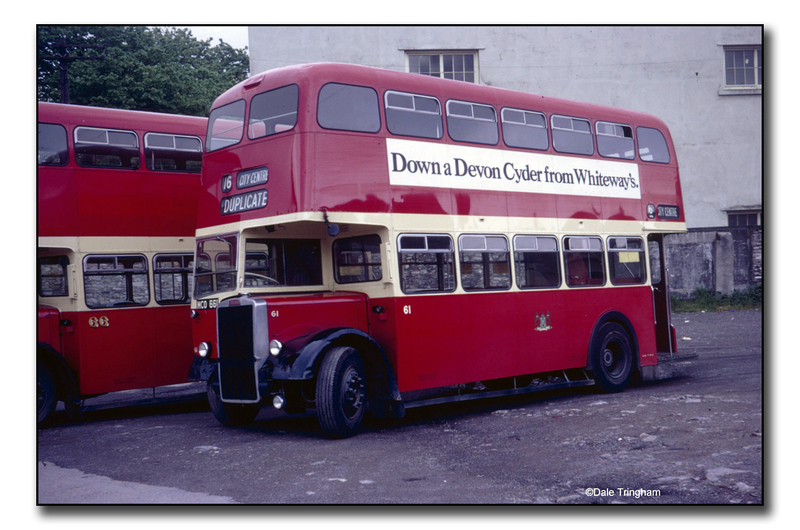 Commercial cider production at Whiteway's at Whimple in Devon ceased in 1989. I do hope my childhood memories of the PD2's in Plymouth - and thanks to you and Dale for posting this latest shot, complete with the classic gold fleet numerals of the 1950s on the adjacent vehicle - did not mask my appreciation for the efforts of the Plymouth City Transport Preservation Group with their sterling work on the Atlanteans. In my enthusiasm for the older Leyland PD2s it was remiss of me not to praise their continuing, unstinting efforts on the Atlanteans and I gladly take this opportunity to do so. No offence was intended by my ommission, of that I assure you!